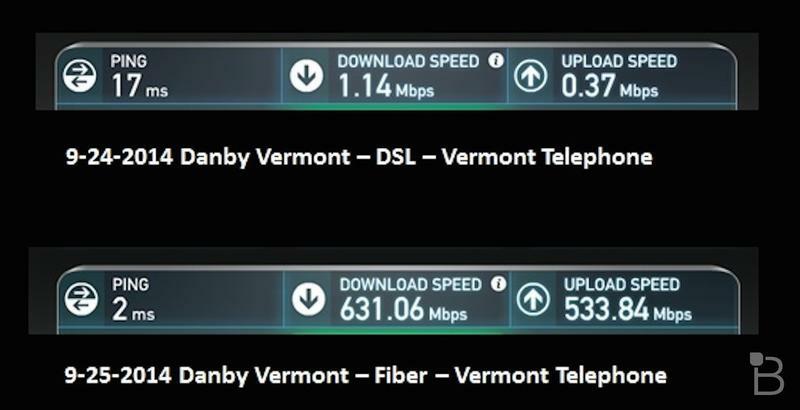 What A Difference A Day Makes - Rural Vermont Now Home to Fastest Internet in the U.S.
How did I go from just over a megabit of poky DSL on Wednesday to over 600 Megabits of fiber-fast Internet connectivity on Thursday – in one of the most rural parts of the northeast? Check out these Speedtest.net results, and I'll tell you the story of what I'm now calling SiliconCowPie. When I purchased 30 acres of land on the side of a mountain in Danby Vermont in 1987, it was to own a piece of the state I'd come to love, and to take my New York City friends camping on summer weekends. My wife and I built a house in 1997, and then immediately moved to California to start ZDTV. It was either sell or rent, and we opted to rent it out and use it when we could. When we built, there was barely phone service, but even so I wired the house up with Cat5 cable, hoping for the Internet someday. Someday arrived about ten years later, with super-slow DSL. It worked, but not for much beyond loading Yahoo.com. Turns out I picked my land well, though. Vermontel (VTEL), the rural telephone company that served Tinmouth, along with 12 other towns across a swath of southern Vermont, wasn't some Podunk cooperative. Instead, it was owned and managed by the visionary technologist Michel Guite. He's plucky too – back in 2010 he convinced the U.S. government to give him an $81 million dollar grant and a $35 million loan to reprise the Rural Utilities Service and replace copper with fiber. Now, four years later, VTEL is almost done. And since our house is about as far from VTEL's home town of Springfield as possible – and still be in their coverage area – I was nearly the last to be connected. I'd seen the trucks rolling around the mountains last spring, and then a few days ago I came back to Vermont to check on the house – and my Internet. Lo and behold, a new box was hanging off the side of my house when I rolled up. 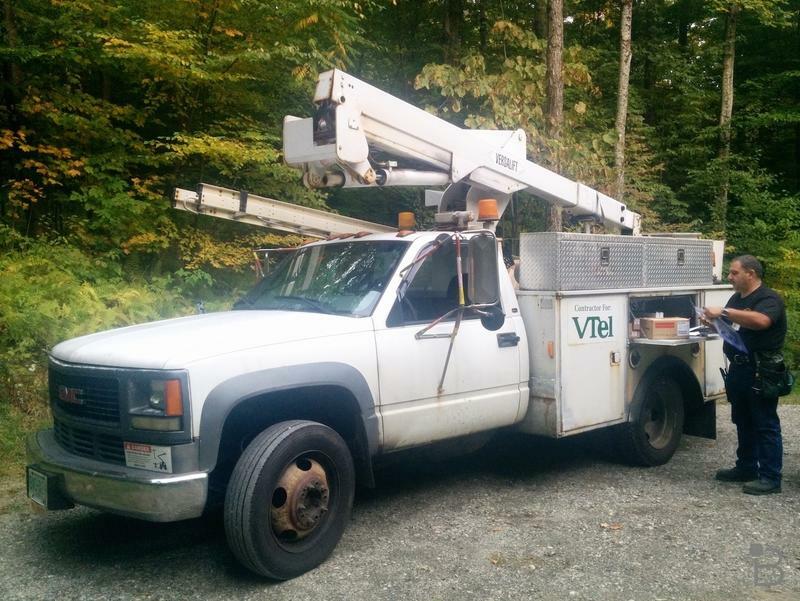 Over the summer VTEL ran a fiber strand from their remote hub in Wells – about five miles away – all the way to my house. They even snaked it up through the conduit buried along my ¼ mile driveway. Inside that simple grey box, as you can see, is a lovely strand of fiber, already capped with a green plug. By the way, doesn't it look like there's an 8-bit Space Invader hiding in the top of the box? Forget fiber to the curb. I now had fiber to the porch. But I wanted it INSIDE the house too. I called up VTEL and after a little pleading they promised to try to connect it during the three days I was there. First one of their technicians came up to make sure that the line showed continuity; meaning that a photon shot down it from the box on my house successfully made it to the hub in Wells, VT. That worked. Then the next day another group showed up to double check everything was working. And finally, as night was falling on my last day in Vermont George Talatinian and Wayne Woodbury rolled up the hill to make the connection and bring my own rural corner of Vermont into the space age. Both Wayne and George are hard-nosed, grizzled veterans of the telecommunications age. Wayne's a Coordinator on VTEL's fiber project, and started working at The Telephone Company (there was just one) back in 1983. He moved into fiber in 1987, and never looked back. George is the technician who gets everything done, from splicing wire to drilling holes in homes to troubleshooting problems on the ground. Both worked extensively on Verizon's FIOS project, and felt the pain when the company essentially abandoned northern New England to its own devices. Much to my surprise, the bulk of the hardware sits outside, not inside. The first thing Talatinian did was snap a hardened Calix Router into that box. 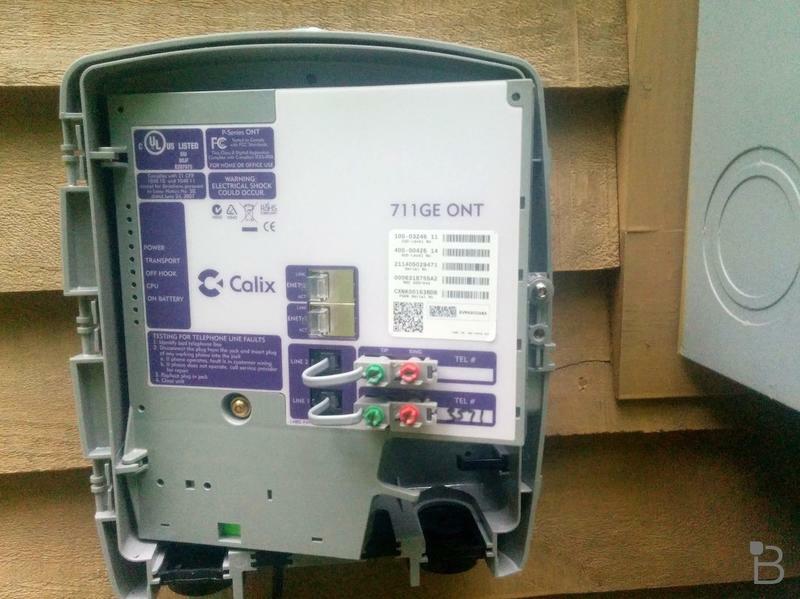 The Calix Router transforms the optical signals from the fiber into gigabit Ethernet (gigE) and telephony (POTS), depending on the type of packet it receives. My box has two gigE and two POTS ports, but I only needed one. They make a 4×4 version too, for small apartment buildings, but that would be overkill for me. 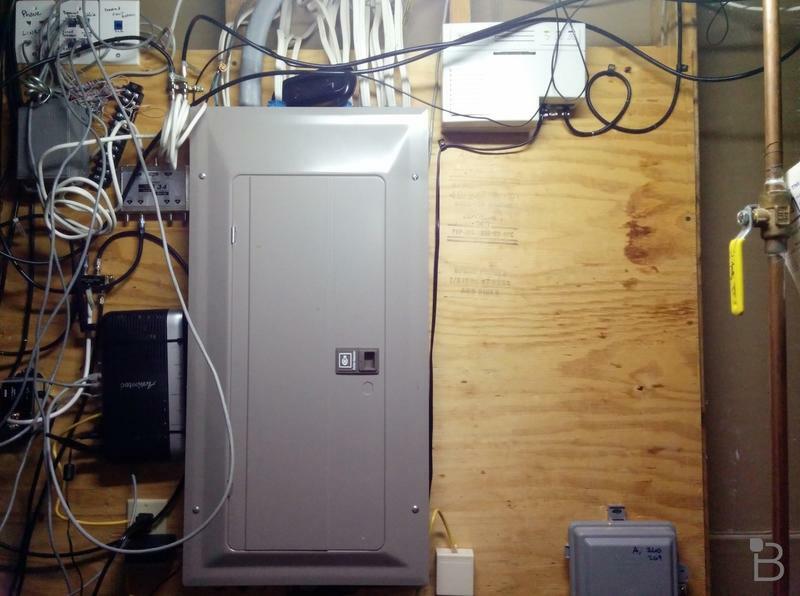 Just about all the smarts sit in that box while everything inside my house stays the same – from wireless router to POTS lines. On the back of the router is where the magic happens. Here's where the connection gets made. And with a deft hand, Talatinian snapped one green plug into the other, and my fiber was connected. Well, not quite. The router still needed power – as far as I know, they still haven't invented POF (Power Over Fiber). So next he drilled a hole in my house, and spliced together a power cable to juice-up the Calix. He also ran two Cat5E cables from the Calix to inside my house using that same hole – one to connect up to my home router, the other to my phone system. But one last piece of equipment had to be installed inside the house. 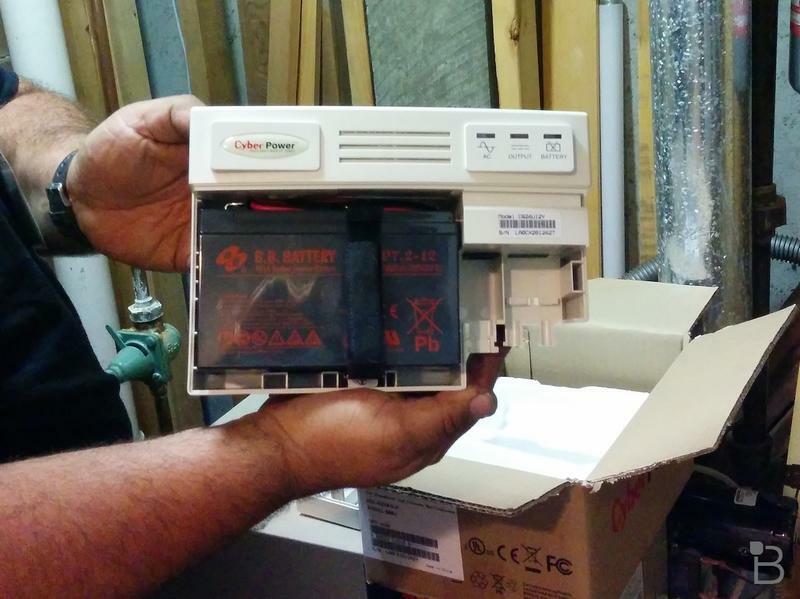 Because both phone and Internet were running over the fiber, and because phone lines provide enough power to activate a handset, the company needed to provide backup power so phones would work if the electricity went down. And down it does go. Sometimes I feel like my corner of Vermont is only marginally better than a third world country. So Talatinian spliced the power cord from the Calix router to the battery backup, and then plugged that box into an AC outlet. A few phone calls and a quick update to my home router and it was done. 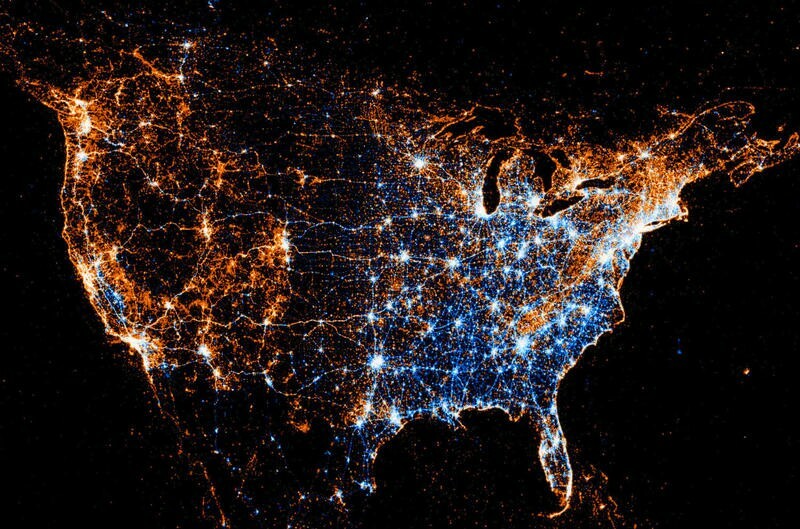 Suddenly I had faster Internet than 99% of the US. Yes, that's my wiring closet. It's not pretty, but boy is it smoking! You already know how it performed after installation – the results were amazing. And according to Woodbury, the company is doing it right. Unlike in Kansas City, where Google laid fiber out on top of the copper infrastructure, VTel wants nothing more to do with that ancient relic of a simpler age. Voice, Video and Internet are all being delivered over the new fiber plant. In fact, the final phase of the project will be to pull down all the old copper wires and presumably sell it for scrap. 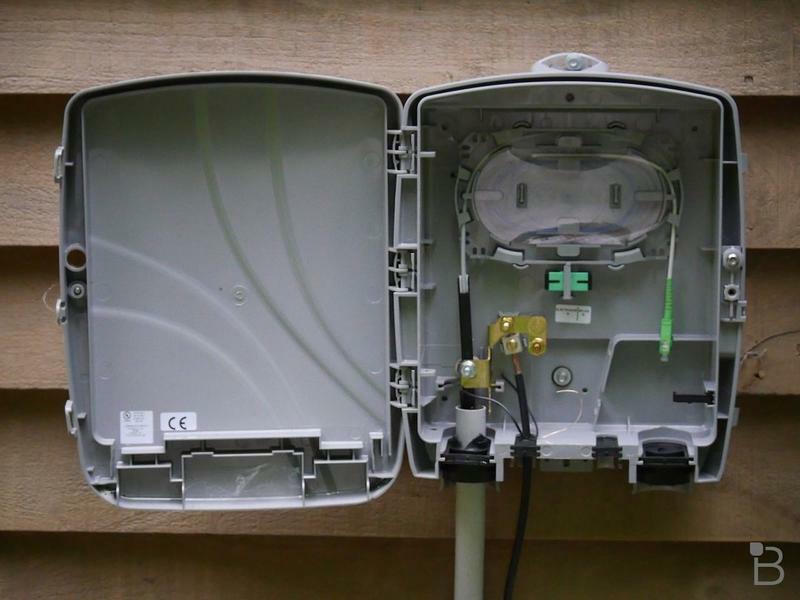 In addition, VTEL's fiber network is "active", which means that every house home-runs to a remote central hub in each town – and each of those hubs are interconnected with an even faster set of bonded 10Gigabit Ethernet fiber trunks. Compare that to Verizon's FIOS network, Woodbury explained to me, which splits each fiber strand into 32 passive pairs. That means 32 houses could be sharing a single gigabit fiber strand, which seriously cuts into available bandwidth, particularly when Game of Thrones Season four debuts in April. The network itself is built with those Calix routers at each home, and some Juniper and Alcatel equipment handling the head-end and long-haul transmissions. 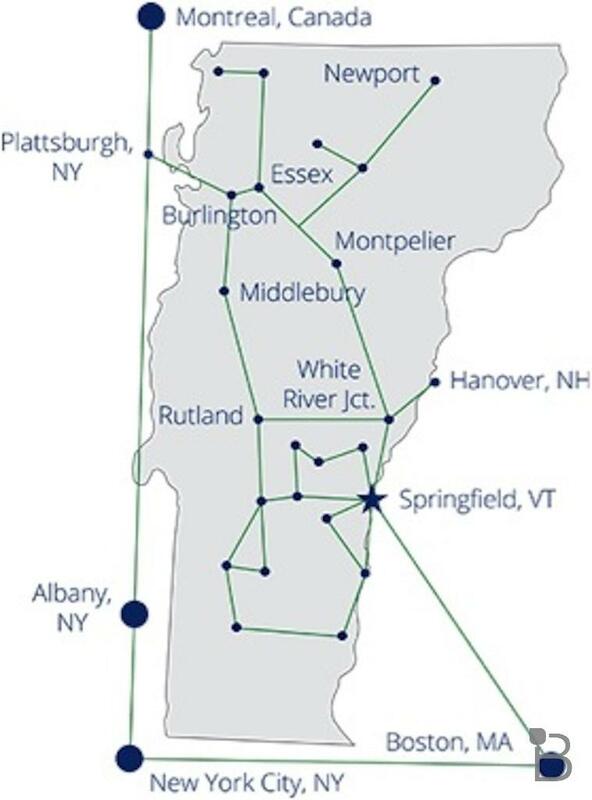 As for connecting to the rest of the Internet, VTEL has a regional DWDM optical network that connects their home office in Springfield Vermont to Montreal, New York and Boston. 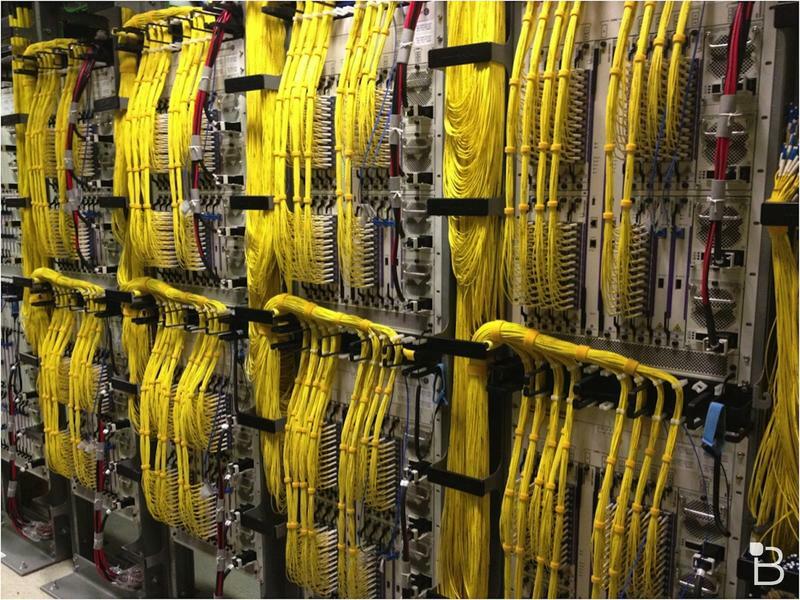 According to VTEL CTO Justin Robinson, "The DWDM network is capable of carrying dozens of 100Gig wavelengths… although to be truthful we have yet to exhaust the capacity on our first 100Gig wave yet." Here's what the network looks like. All that bandwidth helps ensure that my super-fast connection gets out to the rest of the Internet in a timely fashion. According to Robinson, VTEL is only using about 20% of its capacity at peak, which leaves a lot of headroom. What's even more exciting, at least for me, is that by just changing out a router card they can upgrade my house from 1 gigabit to 10 gigabits of connectivity. Woo and Hoo! So how did it work in reality? Sure, I expected super-fast bandwidth to VTEL's own servers, but what about to the Internet at large? I only had time for a few tests, but I was grinning like a banshee during most of them. I ran Speedtest.net to servers in Rochester, NY and New York City, and saw some awesome throughput, although the 48ms ping time to Rochester – less than 300 miles away – was somewhat worrying. I tested three servers on the west coast as well. I expected to see a longer ping time – we're talking speed of light here after all – but I was still impressed with two of them. Softlayer in San Jose, CA hosts a number of startups, which bodes well for future performance. And even though Comcast is locked in a nasty competitive battle with VTEL for triple play customers in some of the less rural parts of Vermont, Comcast doesn't seem to be messing with Net Neutrality elsewhere, as its Seattle servers delivered results similar to Softlayer. 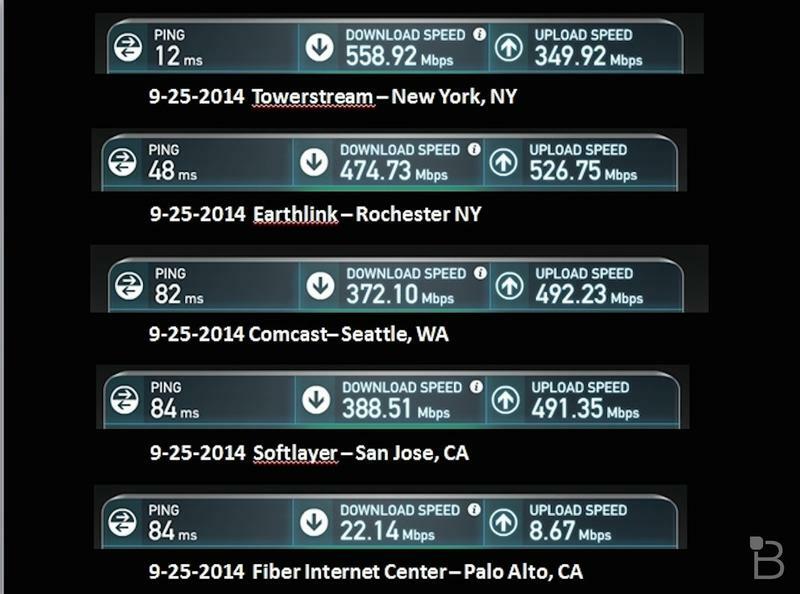 I was concerned, though, by the results from the Fiber Internet Center in Palo Alto, CA. But because these miserably poor numbers were an anomaly, I'll chalk it up to something to investigate, not a ding on performance. So the benchmarks check out OK. What about application tests? I ran video tests across HBO Go, Amazon Prime Video, Netflix and the DirecTV GenieGo in my house in San Francisco. The first three almost immediately snapped into HD mode when I started streaming, and looked great. 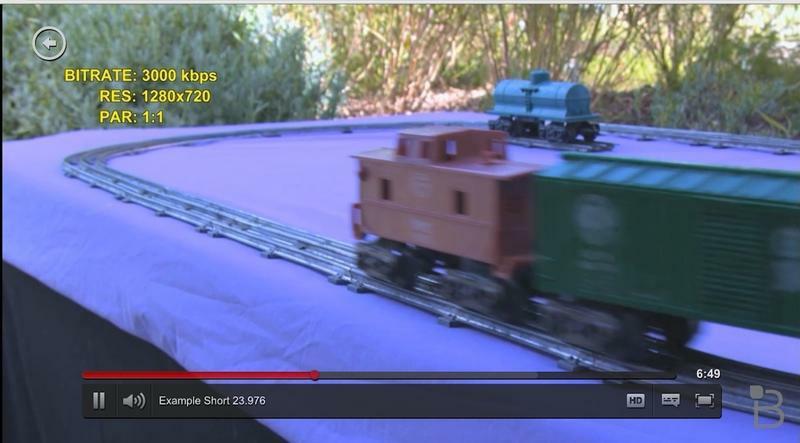 Netflix has a video on its servers that lets you test bandwidth, but unfortunately it only goes up to around 3 megabits per second, and it easily reached that in about 3 seconds. I'd really like to see Netflix come out with a similar test video that can crank all the way up to 4K – I'm excited to test out the potential of 4K video on my new fiber-equipped mountain cabin. The GenieGo, however, looked terrible. Again, I'm thinking this is an anomaly, probably either related to the GenieGo or my own home networking setup. I'll be doing more testing there – and also with the latest SlingBox – to see how well I can move video from my home in Pacifica to my fiber-outpost in SiliconCowPie. Oh, and I did evaluate two of the more common NC-17 skin sites – for testing purposes only, mind you –Results with HD videos were similar to what I saw with Netflix, Amazon and HBO GO. In fact, the handful of videos I played started more quickly than either of the three more mainstream services. I didn't stick around, however, long enough to guage whether picture quality was comparable as well. Finally, I did some bit-torrent testing. I grabbed 10 torrents of concerts from bands that approve of fans sharing their live music performances – mostly old Phish and Dave Matthews Band. Using the latest uTorrent client and a proxy service in Canada, I saw upwards of 14 megabits per second of cumulative throughput across those 10 files, which is pretty darn good. However, after about 10 minutes of torrenting, standard HTTP calls to eTrade, Yahoo and other sites started failing. I closed uTorrent and they snapped back again. According to VTEL, this is probably due to QOS settings in the home router they connected up to the CALIX router on the outside of my house. I'll be testing that in the future. I learned a few other interesting things as well during my tests. First, there are still some tin-foil hat wearing folks in my neighborhood in Vermont. About 2% of VTEL's customers refused to let them install fiber into their homes – and a few wouldn't even let them past the property line. And that was after the very patient VTEL folks explained that in a few months they'd be getting a note saying that their phone service was going away, and only the essential 911 service would be available. For six months. After that, they would be completely cut off, because the copper was coming down. And back in 1997 when I wired up my house, for some reason I only jacked in 1,2,3 and 6 – the two pairs needed to make 10 and then 100 BaseT Ethernet work. But much to my surprise Gigabit Ethernet requires all four pairs in that Cat 5E or Cat 6 wire (the E stands for enhanced, and it's because original Cat5 cable had substandard wiring for the non-used strands). Lots more testing to do, and I need to re-terminate my in-home cables with Cat5E modular plugs, but that's a small price to pay. And according to Robinson, if I connect my PC directly up to the CALIX router on the outside of my house I could see 950 Mbps or more bandwidth. WOW. Consider me a VERY happy customer. 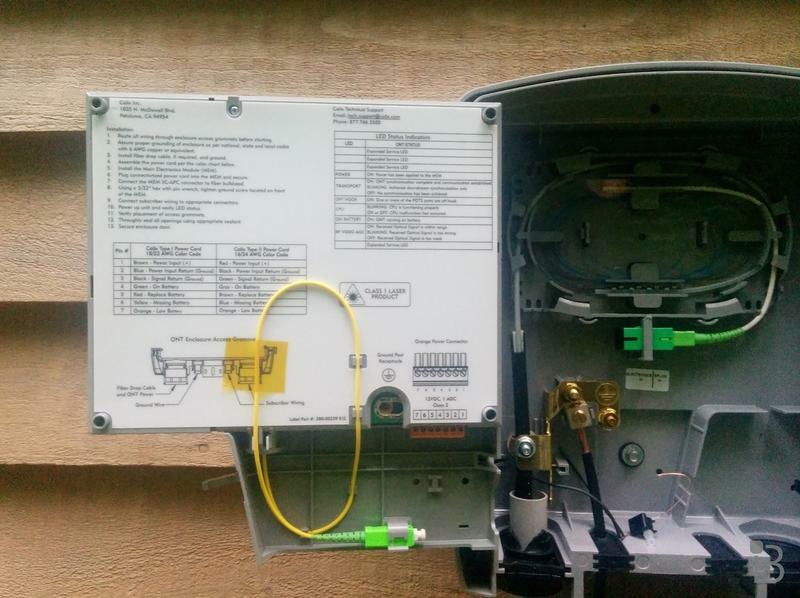 I'll have more, pitting VTEL's fiber against what Comcast claims is 100 megabit cable-delivered IP to my NoCal house, along with more tests on connecting the two homes together, over the next few months.